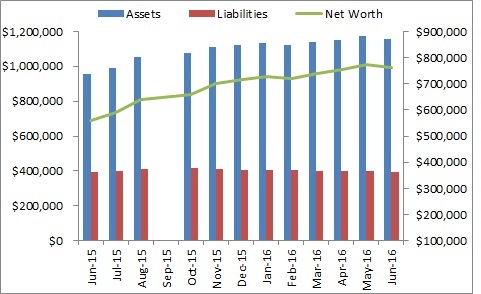 For the first time, the net worth increase this month was driven by positive share market returns. The return was offset by significant personal expenditure from Christmas coming through in January. In the next month I will update my superannuation (retirement account) balances which should increase my assets significantly. I have been trying to find a way to do this on a monthly basis however statements are not updated on that regular a basis. I also expect my disposable income to decrease by 10% next month as my employee share incentive plan kicks in. This, however should not impact by net worth to as I will reduce my investment expenditure to account for this. In my previous post on getting a great deal on car insurance I mentioned that I only considered the regular / full price (or expensive) car insurance and did not really consider discount car insurance due to the peace of mind that comes with a large reputable insurer. However, on later reflection, and as I posted more about the benefits of a discount broker (Interactive Brokers) I thought I would investigate to see whether a discount car insurer could offer the same value as a discount broker. I accepted the fact that for the lower price you don't get all the frills however I set out to see whether it was worth it. A couple of background facts about my situation: I own my own car, I have no loan on it, I live in a suburb which attracts a relatively high car insurance premium and I have never had an 'at fault' claim in ~8 years of driving. Other insurers are new and trying to gain market share (e.g. Progressive Direct, a subsidiary of US insurer Progressive, is offering really cheap rates in order to gain market share in Australia). Their PDS looks great and they look like they are offering the same service as the big insurers for a much lower price. Ordinarily this is exactly what I'd be looking for. The reason I didn't go with Progressive Direct is that I have no idea what they are like when you claim. With most insurers all you need to do is google for product reviews and you get a general idea what they are like on claims. Some have relatively good reputations (e.g. GIO, AAMI) and others tend to get ripped to shreds by consumers (e.g. Bingle). You do not get the ability to look up what a new insurer is like and so are taking a risk that they will not pay out which makes your insurance premium meaningless. The reason I ended up sticking with the full service insurer is peace of mind. The more I looked into it the more I realised the comparison with discount brokers was not warranted. With a discount broker you are getting the discount for your own research and financial savvy. With a discount insurer you are paying less because you take on the risk that they will refuse to pay out for an unexpected / unforeseen reason or that they stick you with costs you do not expect. In the insurance case you have no control over the company's policies and whether they will pay out so what you are paying for with a full service broker is a reputation for fair dealing. Given that I have had the benefit of a corporate credit card (and having been recently bitten by that same card) I thought I would give an overview of good ways to use them - and how to personally benefit from a corporate card. Corporate cards are normally given to employees who regularly have corporate expenditures to avoid the hassle of cash reimbursements. Run of the mill expenses that these cover include taxi's home (for those who often work late), meal budgets (again for those who work late) and corporate event expenditure for those who are responsible for booking / paying for these events. My experience was with the American Express corporate card. The way the system worked at my previous employers was that I would incur expenses on the card, keep the receipts along with client charge codes for those receipts. Once a month my personal assistant would then take my receipts and put them through the system and I would get reimbursed about 2 weeks before the bill was due so I could pay it. The reason the company didn't pay the card off itself was that if they did not approve of the expenditure then they would not reimburse you for it and you had to pay for it personally. My normally expenditure in a month ranged from $2000 - $3000. I did not pay off the account as soon as I received the cash. As the reimbursement was typically deposited in my account 2 weeks before the bill was due, I would transfer this amount to my offset facility for my home loan and therefore pay less interest. Again this amount may seem trivial but it cost me nothing and I would save !~$100 per year in interest. This sort of return associated with any sort of risk or if it required any of my own capital is totally not worth it but given that it wasn't my money and it cost me nothing it was a no brainer. I used the above system effectively for the last 3 years at my previous employer. The problem arose when I switched employers. My corporate credit card was cancelled in October when I left however in December I received an overdue notice from Amex for charges (relatively minor) incurred in December. I tried to sort it out with my previous employer but they are not that helpful given I am no longer an employee there. I then tried to find out from the vendor what the charges were for however given they were taxi charges the business owner was on leave for the Christmas holidays. Under normal circumstances I would have paid the bill and tried to sort out the issue later. The problem is that when vendors refund credit card charges, they refund them to the card they were charged against which in my case has been closed already. In the meanwhile late charges etc. build up and American Express has been remarkably unhelpful. I think I will end up just paying the amount so that it does not affect my credit rating too badly but for all those with corporate cards you need to keep in mind that this may happen. Continuing on from yesterdays post, I thought I would walk through an example of an investment I recently made in the FTSE100 index. You may notice that I have not included anything on fundamental valuations in the market above. For stock specific investments this is something that I would almost certainly do. However given that all you are left with is market risk when buying an index (and country risk in this case) you're essentially looking to see if you think the market is overblown. The UK market has shown marked declines since the GFC and being part of Europe is being tainted with Europe's woes so I'm comfortable that even if it is expensive on current earnings, once confidence returns to the area then share prices / the price of my index will recover. Again I want to stress that in investing in index's my thesis is not around absolute valuations in the way my stock investments are. They are about a diversified "safe" investment for which I'm trying to get some downside protection which is what the currency offers me. The Chart on the left shows the FTSE100 return over the last ~10 years in GBP (blue line) and AUD (pink line). The gap is purely exchange rate differences. The exchange rate risk is that that the gap widens (from a negative risk perspective) or that the gap wides (positive from a risk perspective). Once I decided that I wanted to make this particular investment I started to look around for an ETF that would give me the right exposure. I wanted full currency exposure so did not want any sort of currency hedge. The easiest way is to look for an ETF listed in your own country. This wasnt an option for me so I found the iShares FTSE100 index listed on the LSE (LSE:ISF). They are also listed on various other markets but I only wanted to the AUDGBP risk (i.e. I didnt want USD / EUR risk also mixed in). I then used my Interactive Brokers account to buy my desired quantity. Since my investment the currency has moved against me slightly and the index has increased slightly so I am showing on a slight negative return. Ishares (run by BlackRock) has plenty of these type of investments which are definitely worth checking out. As I have mentioned in a previous posts, when your home currency is particularly strong (like the Australian dollar currently is) it makes a lot of sense to invest your money in overseas markets. The strong currency, especially if significantly overvalued, offers a great hedge against bad market performance. For me personally, there is a double benefit. International markets (e.g. US, UK, Europe) have significantly underperformed the Australian stock market in recent years due to recessions in those markets (and the GFC) while there has been a mining / China related boom in Australia. That is not to say that these markets are cheaper on a multiples basis - the Australian market is actually cheap on a relative basis due to the high earnings levels. However currently risk in the Australian market is on the downside while many international markets offer significant upside risk. What I mean by that statement is that although companies in Australia look cheap no their current earnings, the resources earnings are dependent on China. If China slows, these earnings slow which impacts the sentiment in the whole market and affects stocks totally unrelated to the mining sector. On the other hand given the low growth in the US / UK due to continuing threats of recession, the companies in these markets look relatively expensive based on current earnings. However the risk (measured as volatility) is on the upside (except Europe which is a special case) so if you're not looking for short term returns, the recovery in these markets could offer a very attractive return. If my home currency was at fair value against the USD or GBP it probably wouldnt be worth the risk for me. I don't have time to keep track of these markets as well as my home market. However given how overvalued the currency is it provides a buffer against a downturn. Further by investing through an index ETF you're getting the total market return which means that you can just concentrate your efforts on the currency performance as there is no stock specific information that you have to keep a really close eye on. The easiest way to invest in foreign index ETF's is to see whether there is one listed on your home market. iShares offers a wide variety of low cost ETF options. In Australia they have an S&P500 ETF (ASX:IVV), a Nikkei ETF (ASX:IJP) and various others. The key thing to look for is to make sure that there is no currency hedging. This totally removes the benefit of your strong local currency. If there is no ETF in your home market (e.g. there is no FTSE index listed in Australia) you may need to invest in an ETF on a foreign exchange. If you have a cheap international broker like Interactive Brokers this should not be an issue. In my next post I will give an example of how I went about investing in a foreign ETF. As you may have noticed from previous posts I recently signed up with Interactive Brokers and have been reviewing the product right from set up through to my discovery of all the pros and cons. As a recap, the pros so far have included amazingly low transaction costs and the speed at which funds are credited to your account after the first transfer. The cons so far have included the time taken to set up the account, the fact that you can't invest in DRPs. Unfortunately today I am adding another con to the list and this one is more of an issue with the acutal WebTrader platform. I tend to use WebTrader instead of the Trader Workstation because I mostly trade when I'm at work and am unable to download the software onto my computer. Yesterday I was attempting to put through a trade on the LSE and WebTrader would not give me any pricing data about the stock (not even the current market price). Given that I had only transfered a limited amount of money into GBP for the trade I wanted to make sure that the market had not gone against me (i.e. so I wasnt entering a trade where I did not have enough GBP) to cover it. In the end I was forced to underestimate the number of shares that I could buy based on the delayed price from yahoo finance. Further the price had actually moved in my favour so I could have bough significantly more than I had originally anticipated. I was also forced to enter a market order and not a limit order as I didnt know how close to the market price the delayed data available elsewhere was. These combined to leave me with excess GBP which I can't invest in anything else (and the transaction costs mean there is no point moving them back to my home currency yet). This is the first time that I have had this particular problem with WebTrader. I have traded stocks on the ASX and Xetra exchanges and have not had this issue before. I am surprised that it exists for an exchange as large as the LSE. Any comments on how to get around this issue would be much appreciated. Yesterday I posted on my proposed share allocation split on a month to month basis. Today I decided to go into more detail on the issues associated with both direct share and index fund investing. One of the biggest dilemmas I find when debating which shares to invest directly into is whether to add to share positions that I already own, thereby getting the benefits of dollar cost averaging or whether to look at new opportunities which may have the potential for greater reward. With dollar cost averaging you should know more about the company than a brand new company that you are looking at - this gives you an inherent advantage straight away. Further it allows / forces you to invest right through the cycle of share prices. The disadvantage however is that you may have a thesis about the company that is not playing out in the market (yet). Further investing in these companies feels like throwing good money after bad if the stock has been going down or buying in at a much higher price than your original thesis contained. New opportunities are often the ones an investor gets most excited about. There is a new thesis associated with them and the returns often look better - however this is often just hubris. You get the benefits of diversification however you have the added disadvantage of having to keep track of even more stocks and you end up with a small amount in a great many stocks which is the purpose of the index funds (in my case) whereas the direct share investments are meant to provide the alpha return which typically comes from a concentrated portfolio of good investments. Index funds seem like the typically set and forget type investment so you may find it curious that I'm writing about allocations in it. The fact is that there is no perfect index funds. Although they remove stock specific risk they are still subject to country risk, market risk, currency risk, political risk. Some of these can be used to your advantage. In my case the Australian dollar is currently very high against the USD, GBP and EUR so I have been looking at index funds in these countries. You then need to weigh it against the other types of risks and how you view those markets. Again the dilemma arises about re-investing in index funds that you already have or seeking new funds which may have different benefits. For example at different points in time a GBP FTSE fund may offer a better currency play vs a USD S&P500 fund. The best thing about index funds is that you can concentrate your efforts on what is going to happen to the currency as there is no alpha benefit from these funds. There is no real solution to the above investor problems. Everyone faces them and each investor needs to decide how they will deal with them on a case by case basis. I had also decided to limit the amounts I could invest in the market so that my investment plan stayed on track. In this series I'm going to post about exactly how I'm going to allocate my funds in the various asset classes. In this part I will be covering my investment in the stock market. In a previous post I mentioned that the ability had arisen for me to participate in my employee share plan and that the returns available were outstanding. I have decided to participate in this plan to the maximum amount allowed ($730 per month) which leaves $2,570 left for the share market. Of the remaining amount I am allocating half to individual stock investments ($1,285) and half to low cost index funds ($1,285). Given the transaction costs on a circa. $1,000 investment can really start to add up I have decided to invest in these classes in alternating months. Tax implications in your jurisdiction: I have no idea what the tax codes are like in the US / UK etc but in Australia if you hold an investment for 12 months you get a 50% discount on the capital gains. However if the shares are issued at a discount then you have an upfront tax liability associated with the discount. The incentive is to therefore cycle the shares straight away. The best thing about employee share plans is that you can put in place a plan whereby you may get essentially a substantial riskfree return. For example if your discount is 15%, shares issued every six months, with a personal cost of funds of 2.5% p.a. and no tax benefits to holding the shares - everytime you get issued the shares you should sell them straight away and get an annualised pre-tax return of (15% - 2.5/2%)*2 = 27.5%. This is an outstanding return in it's own right however when you consider that it is essentially risk free it becomes an unbelievable return! Most employers will limit how you can contribute to these schemes. If I had a choice I would be putting all my investment funds into it! Interactive brokers - wire transfers - too easy! In a previous post on interactive brokers I had mentioned how difficult it was to both set up the account and also that it took 3 days to fund the account which I viewed as a real downside to using the interactive brokers platform. However it turns out that I was wrong. The 3 day transfer of funds period appears to only be for the first transfer into the account. I transferred in funds yesterday in the afternoon and found that it had already been credited to my account before open of business today which I was very impressed with. It takes away one of the biggest downsides to using interactive brokers. For all the Australian readers of this blog - one of the things you need to get your head around is the terminology. Interactive brokers recommends using wire transfers to transfer money into your account. If you look up wire transfer with your bank (I checked NAB and CBA) they say that they will charge you $90. However this is only to transfer to interational banks. If you fund your account in AUD (as I do) then you only need to do a netbank transfer to Interactive Broker's Sydney branch (they give you the details after completing the pre-transfer form on the accounts management page). For the first time in my investing career I'm coming up against the problem of maintaining discipline in my investment approach. This is because I am completely convinced that this is a buyers market. As I am a long term investor the week to week and month to month movements in share prices do not bother me at all however against nearly all historical averages the markets look cheap. The problem is that I have set my self investment goals outlined in my 2012 financial objectives which basically revolve around certain allocations on a monthly basis. Given my belief in the value in the market (which I may cover in greater detail in a later post) the temptation is to reallocate funds from my investment property loan into the stock market (effectively gearing up my portfolio). There are real benefits to having an investment plan, not least being that it stops you from foolishly buying during periods where prices and sentiment are high and also forces you to buy when the market looks terrible and it is tempting to stay away. I confess that I have not always followed this plan. When the market was tanking in the second half of 2011, I was largely out of it and I lost out on buying at some of the lowest points there. The market is back at these low points and I want to be careful of not going too far the other way. I have decided to largely stick to my investment goals. I have set myself a limit of 50% on the up and downside when it comes to new investment in the stock market every month (i.e. $1,650 - $5,000) with the requirement that I never be more than $5,000 away from my planned allocation. For the first time in several years I sat down and wrote what my goals were for the year. Also for the first time they were not all with a career / advancement / get ahead type of flavour. When I thought about the last couple of years I realised how much I had not yet done from a personal point of view. After taking into account all my personal goals I then looked at my financial goals for the year. What I realised was that to fund some of my personal goals my financial goals would suffer. I am still going to set aggressive financial goals however they have been scaled back significantly from what I originally had in mind. While this accounts for most of my wage per month I get a significant amount of income each year from my bonus. This year, however, I have decided to spend my bonus on a sports car. Whilst this may seem like the silliest thing to (i.e. buy an expensive depreciating asset) I have come to realise that life is very short and I dont really want to be an old man driving a sports car. Any excess will be used to fund a reserve cash account which I have been meaning to set up for a while. Going through this process was a very valuable experience. I cant recommend strongly enough the importance of going through this exercise, not only from a financial point of view but also from a personal perspective.